As early as the Predynastic Period, around 4,000 BC and through the New Kingdom, 1550-1070 BC, there were several specific animals that the Ancient Egyptians viewed as manifestations of divinity. This religious practice continued to grow throughout the Late Period (712-332 BC). Among the animals adored by the Egyptians was the cat, the representation of the goddess Bastet, the protector of the home and symbol of fertility. 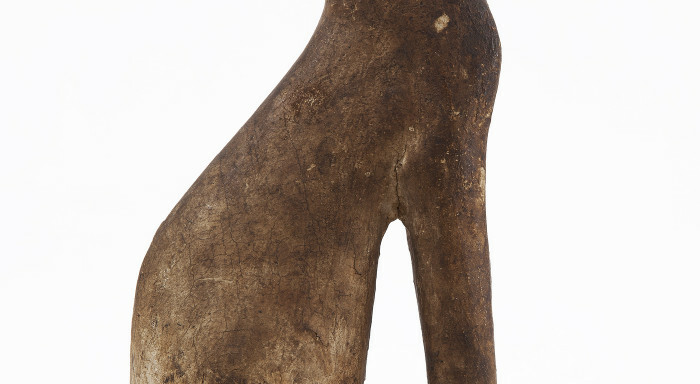 Cats were frequently embalmed and placed in special funerary boxes decorated in the shaped of a cat, as shown by the samples proposed for restoration. The main sanctuary of the goddess Bastet was located in Bubastis in the Delta of the Nile and was regarded as an important place of worship as of the 12th Dynasty (945-712 BC). In this period the faience cat statues were made in both bronze and wood. In Bubasti, a large cemetery dedicated to cats was found in a variety of other locations including Thebes.